Singles: "Love Lockdown," "Heartless," "Amazing," "Paranoid"
For 808s & Heartbreak, Kanye got New York-based artist KAWS to create the deluxe album cover, which in its original design was a deflated heart photographed by Kristen Yiengst and art directed by Virgil Abloh and Willo Perron under the Past Tell Museum name (the creative group precursor to DONDA). Kanye wore a similar heart-shaped pin in the promotional images for 808s & Heartbreak, photographed by Willy Vanderperre. The stripe of colors on the left of the album resembles the color palette from Graduation, except these are visibly more pastel. As with all of his covers so far, Kanye is not literally present. 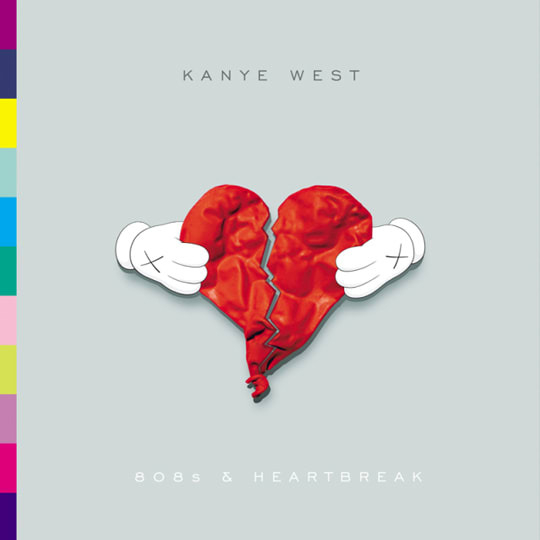 808s & Heartbreak changed it up both sonically and aesthetically, as the first cover to not feature Dropout Bear.